It’s always nice to see old friends. 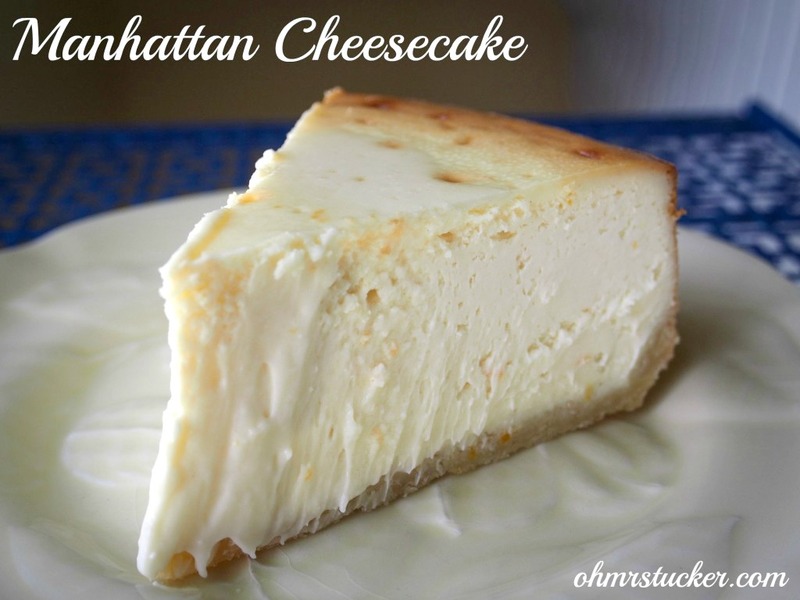 Today it’s Manhattan Cheesecake revisited. You should note that if you’re searching for the most perfect cheesecake you’ll ever taste, your search ends here. This particular cheesecake is the creamiest dream with a whisper of lemon. The cookie-like crust isn’t a bad touch either. Ohmygosh, so much swooning over a the most delightful cheesecake! Our love hasn’t waned one bit and I thought I’d share the recipe again for anyone who missed it the first go around. SIDE NOTE: For those of you who don’t feel like baking, cause let’s face it – we’re busy busy people, Cheesecake Pie is an ideal alternative. People. I almost have no words. This cheesecake is that good. I have no idea who deserves credit for this recipe; I wish I did. They deserve a kiss. I cut it out of the food section of a newspaper years ago, and when that paper faded, copied it onto note cards. I would happily give credit where credit is due, but I truly have no idea. While it’s a simple recipe, but a bit time-consuming. It’s worth the work and the effort. The added bonus is the arm workout you get from beating the cream cheese into submission! Consider it calories well spent for those you about to consume. Once you read through the recipe, you’ll note that you are directed to let the cheesecake sit in the fridge overnight. The hours that the cheesecake sits in the fridge is allowing the flavors to marry. Consider this their wedding night and DO NOT DISTURB. Also, once the cheesecake has finished baking, leave in the oven, with the door ajar for about an hour or so (longer if the cheesecake is still warm to touch). This step usually prevents the cheesecake from cooling too fast and thereby cracking. A slow and steady cool down is what you’re after. What to do if it does crack? Simply add a topping, chocolate sauce, ganache, fresh fruit, OMT!’s pear or apple butter, or whatever you desire, over the top, thereby hiding any cracks. Y’all we’re baking here – it’s not rocket ship building – we get to zig if the cake develops zags in the form of cracks. Alright, my babies – if you’ve read this far, congratulations, you no longer have to search for the most amazing cheesecake you’ll ever bake. Just make sure you never lose it. This most wonderful concoction will become a beloved family tradition. 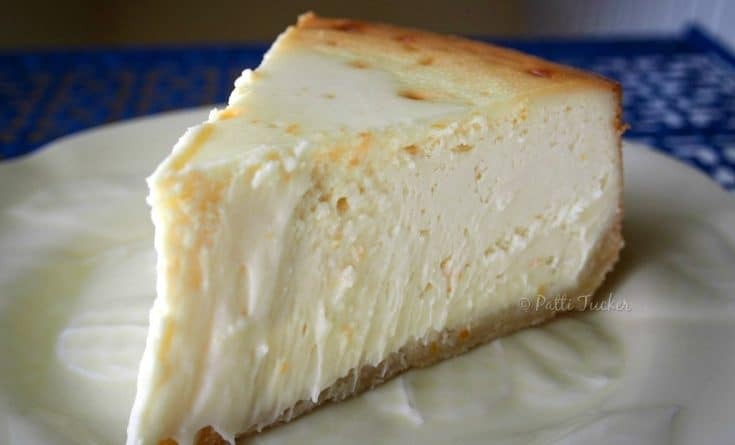 While I have deprived you of the fun of baking 100 cheesecakes in your quest of a drool-worthy dessert – I have saved you time, which translates to more cheesecake eating! If you’re anything like me, you are always on the lookout for the “best” recipe for the foods your family loves. Consider yourself done looking for the best cheesecake recipe: this one is it. Consider this yer special invitation. This Manhattan Cheesecake is the last cheesecake recipe you'll ever need. Combine flour, sugar and lemon peel. Make a well in center of flour and add vanilla, egg yolk and butter. Work quickly with a pastry blender or fingers until well blended. Form into ball and wrap in wax paper. After refrigerated for one hour, preheat oven to 400°. Roll out half of dough 1/8 inch thick. Remove sides of 9-inch spring form pan. Butter bottom of pan and place dough on it, trimming off excess. Bake about 9-10 minutes or until crust is golden. When crust is cool, butter sides of pan and attach bottom w/crust. Prepare filling, then finish crust by rolling out remaining dough. Line sides of pan with strips of dough, making sure it does not go up any more than 3/4ths of the way up the pan. Beat together cream cheese, sugar, flour, orange and lemon zest, and vanilla until smooth, using a wooden spoon. DO NOT use an electric mixer. Add egg yolks and eggs, one at a time, stirring lightly after each addition. Pour filling into crust, then place in the 500° preheated oven. Bake 10-12 minutes. Reduce heat to 200° and bake an additional hour. If top starts to brown too much, cover with foil. DO NOT top cheesecake with foil unless it is browning too quickly. When cheesecake is done remove from oven and cool for one hour in draft-free place. 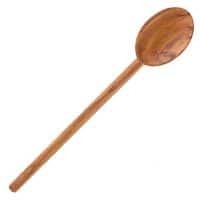 ~ For the crust, I never fiddle with the sides of the pan. I simply roll out enough for the bottom, filling in any weak spots with extra dough, then bake per instructions. ~ Since oven temps vary (especially in older ovens), you may need another 10ish minutes of baking. ~ When cheesecake is done (will still be a bit wobbly in the center if you shake the pan), I simply turn off the oven, crack the oven door and let it rest there for an hour. This usually prevents it cooling too fast and thereby cracking. Tired after all that peeking into the oven to make sure yer cheesecake behaves? 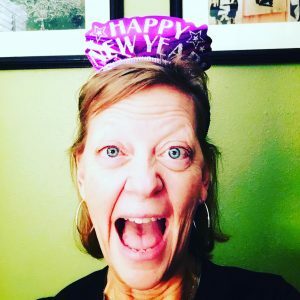 Need a simple – no nonsense way – to gather more delicious OMT! recipes in one fell swoop? Oooo, you could use that caramel sauce here! GET ADVENTUROUS! And then come back and tell about it! Yes this would be a vigorous arm workout! That means I could have a bigger slice, LOL! I see we think alike! Huge baked cheesecake fans in our house – all of us! I usually buy because life is short and all that but sometimes it’s nice to take the time to make something really special. I love that you added tips from your experience, makes all the difference. And I love that the ingredients get a wedding night in the fridge too – bless! A good marriage is built on quality time alone! 😉 This cheesecake is worth the effort. I’ve never had one that rivals it, bought or homemade. I’m sorry to say that I don’t know, Kristi. Ooh I like your cracking tip, I have to try that. Thanks for posting. Hello from Wonderful Wednesday. Sounds delicious! I’m worried about the citrus flavor. Could I omit them and it still turn out? Do I need to add vanilla or something? 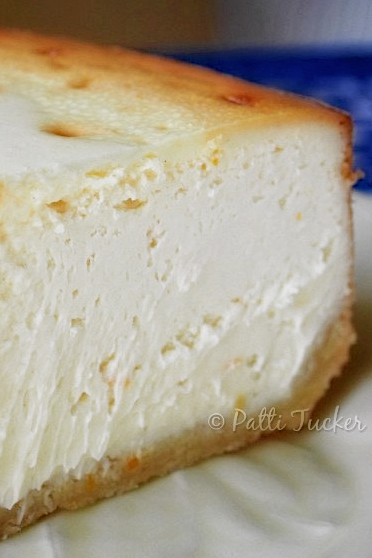 I’m sure you could omit, but it’s a subtle flavoring and it makes the cheesecake HEAVEN! Could you use a Kitchenaid stand mixer on a low setting? I have carpal tunnel in both wrists and I don’t think I could beat all that cream cheese. Kristen, I’m not sure, as I have never tried it before. You are right about it being a lot of cream cheese. It’s a beast to stir. IF you do try it with a mixer, come back and let us know the results. leave the cream cheese out for 24 hours to get really soft and cut it into chunks and it wasnt that bad to do by hand. Well worth the extra dense cheesecake. Haven’t tried it yet but the recipe reads like the one I have been searching high and low for FOR DECADES! Can’t wait to try it! Get ready to LOVE this cheesecake, Donna! Trying this cheesecake recipe tonight. It’s making too much for my 9 inch pan though, I already cooked my crust in it thought so I will use the extra filling in one of my smaller pans to make an extra. Stick in fridge after it has cooled completely. Enjoy! I wholeheartedly agree. It gets my goat when someone won’t share a recipe. It’s one of the first things we teach our kids: it’s nice to share! looks so good!! Now I would like to bake this cake! what I shall buy or use?!?! Many thanks in advance for your reply!!! Use heavy whipping cream, it should come like in a milk container but should not already be whipped, it should be in it’s liquid form. 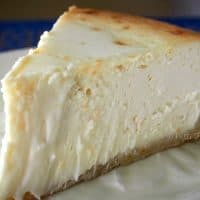 I wouldn’t use mascarpone as that is like cream cheese, but in a pinch if I couldn’t get heavy whipping cream I would use sour cream since the recipe calls for a small amount and a lot of cheesecake recipes use sour cream in them. I bake a lot and I hope that this will help you. Heavy cream is whipping cream. Not already whipped cream, but the kind you can whip. NOT sour cream. NOT mascarpone. This cheesecake is is awesome. Theoretically it is the Lindys cheesecake recipe out of some cooking magazine. Don’t know how truthful it is. Bakes it for Christmas and turned out beautifully. I’m with you the crust up the side was kinda a waste. One thing I’ve learned is that all ovens cool at different rates like mine being a newer gas oven it retains the heat for a long time. I will wait for the top to get the nice deep brown and then open my door for a few seconds every now and then so the temp drops fairly steady to 200 degrees. I cannot understand why people would hesitate to make something like this when you know exactly what you are putting into it and it is FUN to make. Those packaged cheesecakes you buy in the stores are full of other garbage you don’t want in your food and you will get a great feeling of pride when you make something. I cannot wait to make this lovely cheesecake. I love when I can help! Enjoy! I want to confirm that you skip the step of doing the side crust? You just bake the bottom crust, put the springform pan back together, and just pour your filling in? Do you end up with leftover crust mix? Also, do you top this with anything, or serve with a sauce of any kind? Yes, I skip. The side crust wasn’t a hit with my family, so I omit and toss the remaining dough. Instead of tossing , you could roll out and bake, then cut into yummy strips. As for a topping – we usually eat without, but any fruit or chocolate drizzle would be delish! This looks like the cheesecake I have been making for over 30 years. It will always be my favorite and nothing else compares. I do make the sides and I do use my Kitchenaid mixer. When I got this recipe in the ’80’s, it was said to be the recipe from Lindy’s, NY I think. The best cheesecake ever. It’s insanely delicious. I can’t imagine my life without it! I come from Long Island , I worked in Manhattan .. you will never have a cheesecake with a crust on it ! I have made this from Goodhousekeeping cookbook recipe. This recipe doesn’t indicate size or diameter of pan to be used. 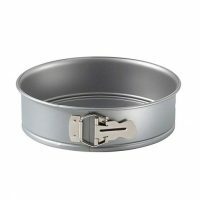 Is 10″ springform pan okay for this recipe? What size springform pan needed…9 or 10″? I use a 9-inch pan. This sounds a lot like the Lindy’s cheesecake recipe from the Pump Room restaurant in the 70’s. Delicious! Have no idea, but you are right, it is DELICIOUS! nothing like a plan cheesecake not topping just cheesecake. Found you on Grandma’s Briefs link party. Agreed! I prefer mine plain. Yum! I grew up in New York, thinking New York cheesecake, sublime as it was, was as ordinary as onions. Then I moved away and it didn’t follow me. Thanks for the recipe. I understand and am happy you found the recipe. Now, get to baking! This is the third time I’ve made this cheesecake. The 2nd time I added extra lemon zest and lemon juice for a great lemony cheesecake. My third is currently in the oven. I swirled blueberry preserves through it. Can’t wait. This is the best cheesecake recipe ever.! In the comments, you mention sour cream is used, but I do not see it in the ingredients list. I’ve made this 3 times, but it doesnt start to set until 1 hour 20 minutes. I’ve used a hand mixer on low, just enough to incorporate ingredients, it seems fine. The taste is out of this world! Thank you for aharing. Sour cream is not used in this recipe! The timing on baking will definitely differ slightly from oven to oven, as ovens can be off a few degrees when set at specific temps. This is my go to recipe. I think it came from the Better Homes and Garden New Cook Book. Look the for red checkered cover (it’s not so new anymore, but this is a great recipe. OHMYGOSH, now I want cheesecake!